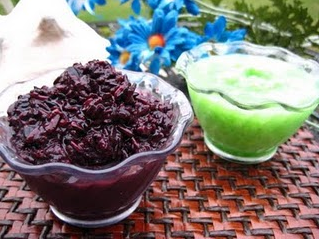 Black glutinous rice and then steamed until half cooked, while black rice steamed prepare 2 cups hot water. At the time of steamed after steaming hot then it flush with the 2 cups hot water and position was still on the stove. While in stir so that the hot water evenly mixed, steamed back until cooked. Remove and add to a large container such as a tray and then averaged and let stand until cool, puree yeast beforehand, sedikan medium-sized container, then Cover with banana leaves up neatly. Put the first layer of glutinous rice and sprinkle with yeast until evenly distributed and you can also adjust the refined sugar tambhakan. For the second layer of glutinous rice, sprinkle again with yeast and refined sugar. Perform up to 4 layers. To cover the surface using banana leaves as much as 2 layers and eventually was helped with a clean cloth as cover. Let stand glutinous rice for 3 days and 2 nights, and store containers will tape tersebbut in a warm room. 0 Komentar Untuk "How to Make Black Tape Ketan Easy and Simple"